Minot State University Summer Theatre presents Jason Williams’s comedy “Greater Tuna” for the second time on the Summer Theatre stage Friday through Tuesday (June 26-30) in the MSU Amphitheater at 8:30 p.m. The box office opens at 7:30 p.m.
Jeff Arlt, original cast member, is reprising his role, and Kevin Neuharth, Summer Theatre director, is once again directing this comedy about Tuna, Texas’ third smallest town. Chris Stroschein, MSU alumnus and Summer Theatre veteran, will join Arlt, as the two actors take on the town’s various wacky characters, including men, women, children, even animals at breakneck speed with the use of some savvy and inventive vocal manipulation. “Because of the multiple characters portrayed by each actor, ‘Tuna’ is 10 times the fun that any audience member should be allowed to have in one sitting,” Arlt said. Stroschein will be substituting for John Weninger, original cast member. Weninger withdrew. "I couldn't be more excited to be back in town for Season 50,” Strochein said. “I'm deeply honored to be stepping into the cast." 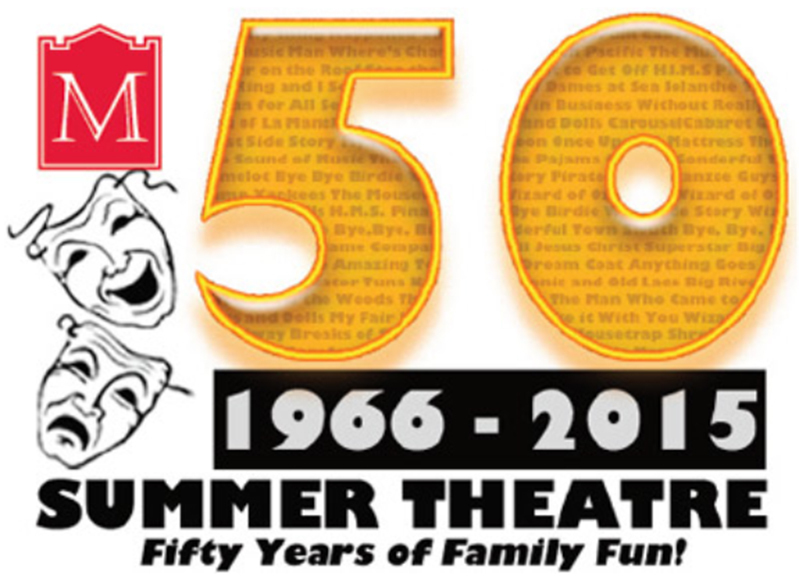 Remaining productions in Summer Theatre’s 50th season are “Little Shop of Horrors” July 7-11 and “The Music Man” July 21-25. For tickets, contact the MSU Summer Theatre box office at 858-3228. Tickets are $10 for adults, $8 for senior citizens and children over 12, $5 for children 12 and under and $3 for MSU summer students, faculty and staff with current MSU ID. There are also special rates for active military and their immediate dependent family members. Reservations are strongly encouraged. For questions, contact Neuharth at 858-3878 or kevin.neuharth@minotstateu.edu. With Minot State University’s endorsement and matching funding from the Minot Area Community Foundation, the Minot Sertoma Club contracted to install induction looping in Ann Nicole Nelson Hall to make events more enjoyable for all those wearing hearing aids and cochlear implants. The work was completed June 19. To assist with funding this project, the Minot Sertoma Club is conducting a Celebrate Sound Walk Thursday (June 25) at Duane Carlson Field from 5:30 to 8:30 p.m.
An induction loop wire is permanently installed (typically under a carpet or in the ceiling) and connects to a microphone used by a speaker. The person talking into the microphone generates a current in the wire, which creates an electromagnetic field in the room. When individuals switch their hearing aids to the "T" (telecoil) setting, their hearing aid telecoil picks up the electromagnetic signal. Individuals can then adjust the volume of the signal through their hearing aids. This technology magnetically transmits sound to hearing aids and cochlear implants with telecoils (T-coils), www.asha.org/public/hearing/Induction-Loop-Systems/. All those with assistive hearing devices should contact their hearing professionals to assure their T-coils are installed and activated. This fall, the Sertomas are planning a performance in which all those with hearing aids will be invited, to attend free of charge, to experience what a difference looping can make. Sertoma, derived from its mission of service to mankind, is a century-old international service club with a focus on hearing health. The Minot Sertoma Club has a 54-year history of emphasizing that mission in the Minot area, and the last remaining active charter member was the impetus of the project. Anyone interested in walking or contributing to the Celebrate Sound Walk can go to www.celebratesound.org/minot. For questions, contact Scharpe at neil.scharpe@minotstateu.edu. 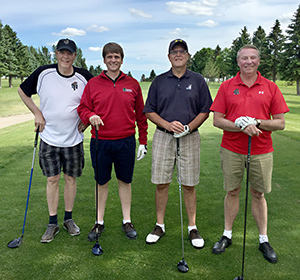 There are stops left on Minot State University’s 10th annual Friend-raising Golf Tour: Bottineau on July 7, Garrison on July 14 and Kenmare on July 30. MSU will recognize area students receiving 2015-16 scholarships at each event. The format for each tour stop will be a four-person, 9-hole scramble. Registration will begin at 4:30 p.m., with a shotgun start at 5 p.m. A social will immediately follow completion of golf. Non-golfers are welcome to attend. Pictured are, left to right, Dan Langemo, MSU President Steven Shirley, Kelly Hayhurst ’87 and Vice President for Advancement Marv Semrau. Minot State University invites alumni and friends to a luau party at the North Dakota State Fair on July 22, 6-8 p.m. The event will be in the outdoor area of the Flickertail Gardens, and admission is free. All paramount chiefs in their country, they traveled with four interpreters as well as an embassy liaison. While in Minot, the visitors met with the directors of the Domestic Violence Crisis Center and the YWCA. They also visited the Minot Islamic Society and participated in “SS 283: Ethnic and Cultural Diversity in America,” a class at Minot State University. MACIV members held a potluck dinner for the visitors at Bethany Lutheran Church. In addition to Minot, planned destinations included Washington D.C., and Jackson, Miss. MACIV is a joint effort between the Minot community and MSU to create professional development and cultural enrichment opportunities for international visitors and for residents of the region. 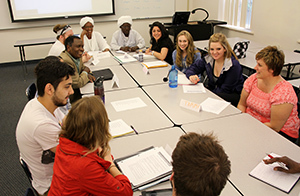 An affiliate of Global Ties US and housed at MSU since 1992, MACIV has worked with the U.S. Department of State, the Library of Congress, and the Center for Strategic and International Studies in developing programs for international visitors. For questions, contact Joseph Jastrzembski, history professor and MACIV president, at Joseph.Jastrzembski@minotstateu.edu. The North Dakota Center for Persons with Disabilities, a Center of Excellence at Minot State University, was recently awarded a contract from the North Dakota Department of Health, Suicide Prevention Division, to assess community needs pertaining to suicide prevention. A suicide-prevention assessment will be completed in the areas of Tioga, Stanley and Minot. Individuals, working in health care or law enforcement in Tioga, Stanley and Minot, interested in participating in the community needs assessment, should contact Brigden at (701)858-3356 or Christine.Brigden@minotstateu.edu. Kaylee Dockter, biology and chemistry major, was selected as a winner in a national competition to participate in the Posters on the Hill event sponsored by the Council on Undergraduate Research. The Bowbells native was one of 60 undergraduate students from across the nation who presented their research to the members of the United State Congress on April 23. It is the fifth time that one of MSU Chemistry Professor Mikhail Bobylev’s INBRE student researchers was selected The previous winners from Bobylev’s lab included Kowan O’Keefe (2014), Braden Burckhard (2013), Zane Young (2010) and Steven Lewis (2009). The students and their research advisors spent nearly the entire day in the U.S. Capitol. Dockter and Bobylev met with U.S. Senators John Hoeven and Heidi Heitkamp and U.S. Representative Kevin Cramer and his staff. During the poster presentation, Dockter and Bobylev met with Diane Grob Schmidt, ACS president, and Donna Nelson, ACS president-elect. ACS is the world’s largest professional society that promotes and supports chemistry and its practitioners. They also met with Dr. Krishan Arora, program director at the National Institute of General Medical Sciences of the National Institutes of Health. Bobylev’s undergraduate research program is supported by Institutional Development Award (IDeA) from the NIGMS-NIH under grant number P20GM103442. 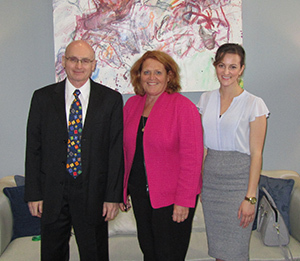 Pictured are, left to right, Mikhail Bobylev, Sen. Heidi Heitkamp and Kaylee Dockter. Minot State University welcomes new employee, Shawn Hill. Hill is a security guard with the Office of Facilities Management. Previously, he worked for RSI in Minot. He is currently pursuing a criminal justice degree at MSU. He has one daughter, and his hobbies involve sports. June 14-26 — “eems-Say inda-Kay amiliar-Fay,” joint senior capstone exhibition by Danielle Bolinske and Tara Thiel, Gordon B. Olson Library Gallery. July 1-Aug. 6 — “Badlands: a geography of metaphors" by Saskatchewan artist Ken Dalgarno, Hartnett Hall Gallery. July 7-Aug. 6 — “Plan C,” an exhibit featuring pottery by Rachel Alfaro, Kalyn Dewitt, Austin Larsen, Sherry Locken, Tyler Loeffler, Emilie Marquardt, Roxi Mathis, Natalie Stivers, Ben Wilson and instructor Linda Olson, Gordon B. Olson Library Gallery. Several of the exhibitors are Minot State University ceramics students, while others are community members who participated in the art department's open studio program. Linda Benson, public information specialist, judged two categories, “Floral Arrangements” and “Glue Solutions,” at Ward County 4-H Achievement Days June 23. Linda Cresap and Kristi Berg, business information technology associate professors, hosted a special interest group, “Let’s Flip the Learning, Not the Faculty!” June 14 and also spoke on their research, “To Flip or Not to Flip: Does Flipping Make a Difference in Student Learning,” at the University Business Tech conference in Orlando, Fla.